This allows you to use a small 14 size battery in your 440-550. Also allows you to shift the battery forward or backwards to gain clearance for conversion motors. All 6061 aluminum and powdercoated for protection from the elements. 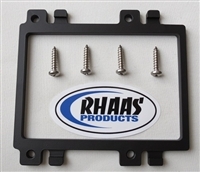 These plates allow you to bolt up a Kawasaki 650-750-800 engine into a Kawasaki 440-550 using the stock 440-550 engine plate. These are the lightest in the industry and made from anodized 6061 aluminum. All stainless hardware is included for the swap. The only kit on the market with 2 engine positions. This allows you to fine tune the ride of the ski by relocating the motor. You can use the stock 650-750 coupler or a re-tapped 550 coupler. This conversion allows you to put a Kawasaki 900-1100 engine in a Seadoo HX hull. All parts are anodized for corrosion resistance. Uses Seadoo 951-800 rear mounts in all 4 locations. This bearing assembly is used to convert your js440 or is550 to run a 550sx pump. Allows you to convert an early hull to a later floating bearing drive. Made from all anodized aluminum and high temp silicone rubber. Stainless Bearing and high quality seals are included and pre-installed. Ready to run. This bearing assembly is made to replace the 1/2" spacer behind the stock bearing housing. The bearings themselves have been moved forward 1/2" to work with many setups. Made from all anodized aluminum and high temp silicone rubber. Stainless Bearing and high quality seals are included and pre-installed. Ready to run. This kit works in any kawasaki 650-750-800 hull and allows you to run a yamaha 650-701-760 motor. The kit contains conversion plates, special height billet motor mounts, and all hardware and instructions to make the conversion. All components are either anodized 6061 aluminum or stainless steel. All that is needed is an ADA Yamaha engine coupler to mate up to the Kawasaki driveline. This conversion kit is simple to complete, all the hard work has been done for you. Setback kit for Blaster twin cylinder motor. This kit allows you to move the motor back 1"- 1 1/4". You can use a custom midshaft to move back 1 1/4" or use a gp760 midshaft and move the motor back 1". Helps to give the boat a little change in attitude and helps getting the nose up for freestyle. Includes motor plates, motor mounts and all hardware to make the swap. Setback kit for Superjet twin cylinder motor. This kit allows you to move the motor back 1"- 1 1/4". You can use a custom midshaft to move back 1 1/4" or use a gp760 midshaft and move the motor back 1". Helps to give the boat a little change in attitude and helps getting the nose up for freestyle. Includes motor plates, motor mounts and all hardware to make the swap. This kit works in any kawasaki 440-550 hull and allows you to run a yamaha 650-701-760 motor. 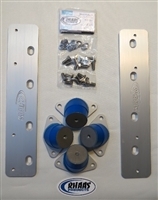 The kit contains conversion plates, special height billet motor mounts, electrical box adapter, battery relocation kit, engine coupler, and all hardware and instructions to make the conversion. If using our 701 conversion, you will need a different engine coupler. Please choose the yamaha engine coupler option..